Ahn Sang-soo, former mayor of Incheon, said Sunday that he will run for the presidency on the ruling Saenuri Party’s ticket. “I will work to relieve people from the burden of debt and make Korea a more livable place,” he told a press conference at the National Assembly in Seoul. Ahn, mayor of the western port city from 2002 to 2010, claimed that he has proven governing capability and economic skills. He served as a member of the National Assembly before being elected mayor. By declaring his candidacy, the 66-year-old joined a crowdfield of Saenuri politicians looking to pull off a dramatic upset victory over the party’s current chief and long-time presidential favorite Park Geun-hye. Gyeonggi Gov. 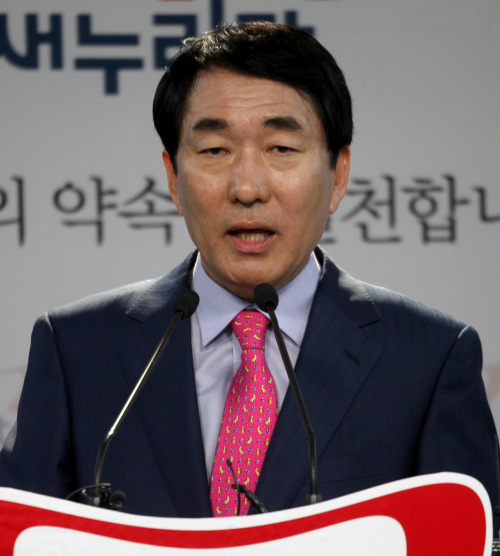 Kim Moon-soo and Rep. Chung Mong-june have already declared their candidacy, while Yim Tae-hee, former chief of staff to President Lee Myung-bak, and Rep. Lee Jae-oh are mulling the timing of an announcement. In public opinion polls, Park holds a convincing lead, although she is yet to announce her bid officially.